There are cream-coloured floors and gilded chandeliers; there are fresh flowers on almost every glass surface. There are scented Christian Dior candles, and fashion history books, and floral settees along French-inspired walls. When I first arrive, Suzanne is upstairs slipping into the first of four wardrobe changes — a voluminous Rubin Singer ball gown, all dreamy-white and strapless with vivid black floral detail. As she glides down the dark wood staircase of her home, a photographer animatedly snapping away and praising her natural ability to pose, the former model’s husband, deputy chairman of Rogers Communications Edward Rogers, rounds the corner. “Wow. Nice dress. Are we going to a party?” he teases, following her down the hall. “Let me see!” says their nine-year-old son Edward IV in a burst of excitement before racing off and hurrying back with an iPad. No stranger to the spotlight, Suzanne maintains her composure — straight back, bright smile, eyes popped — she plays for keeps. “As a mother your answer will always be your children,” says the political science grad of her greatest accomplishment. “And having a wonderful husband. He supports me in everything I do. He doesn’t get the fashion thing,” she laughs, “but he gets how — he loves how — I’ve taken that passion and brought awareness to children’s charities. And he’s very supportive of all of that.” The two first met when they were teenagers and later married in 2006. As a fixture on the fashion and philanthropy scene in Toronto, Suzanne has championed the rights of vulnerable and abused children for years. 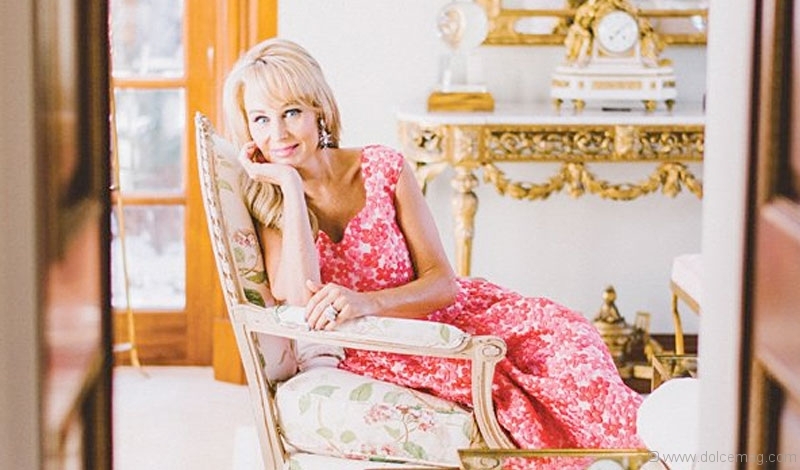 Often seen in the most dizzying array of couture garments, almost always in various shades of pink, Suzanne’s commitment to haute couture and upcoming designers has helped raise millions for causes close to her heart, right here in the city. “Suzanne is always impeccable. She has a very clear sense of her own style and she isn’t afraid to make a statement with the clothing she wears,” says American fashion-designer-turned-friend Zac Posen in an email during New York Fashion Week. Last year, the two collaborated on Posen’s first Canadian runway show for the third instalment of Suzanne Rogers Presents, a series of exclusive fundraising events that bring international designers and their collections to the fingertips of couture-minded Toronto women. SRP is arguably the city’s most glamorous charity gala, culminating in spectacular runway shows from designers who share Suzanne’s vision of combining fashion with philanthropy. In 2010, none other than the late, great Oscar de la Renta — who took a chance on Suzanne’s fashion-fuelled philanthropic work after a meeting in his New York City office — established a precedent for what was to come from SRP as the event’s inaugural designer. “He was the most warm, welcoming, kindest man,” she says fondly of the fashion legend, her crystal-blue eyes holding down a blink. A year later, Suzanne joined forces with Georgina Chapman and Keren Craig of Marchesa, who brought their first runway show in years to Toronto. Since its inception, SRP has collectively raised a whopping $2.5 million for low-profile charities. “There are projects that come to me that don’t suit me or suit what I like to promote, but once in a while one comes across my desk and it’s like, ‘wow.’” Since 2011, Suzanne has dedicated herself to Boost Child Abuse Prevention & Intervention, an inconspicuous community-based organization that provides services to children, youth and their families who have experienced abuse or violence. Offering prevention programs in schools and the community, and teaching children skills to reduce their vulnerability, Boost turned out to be that “wow” charity she was waiting for. She began attending the non-profit’s annual fundraising gala and subsequently became a major sponsor and honorary chair of the Butterfly Ball, her high profile helping to increase attendance and donor dollars. Boost, along with Holland Bloorview Kids Rehabilitation Hospital in Toronto, are the major beneficiaries of SRP. Others include HealthyKids International, the Herbie Fund and the Children’s Aid Foundation. Apart from her deep commitment to Boost, Suzanne is also a committee member of the annual fundraising event Scrubs in the City (which has, to date, raised over $3 million for the Hospital for Sick Children), an honorary chair of the House of Forward Foundation, which has supported Oolagen Youth Mental Health for the past two years, and a board director of the OneXOne Foundation. “I’m very focused on children’s charities because I have three children [Chloé, 17; Edward IV, 9; Jack, 7], and they are very fortunate in life. They are going to the best schools in the city; they are very well taken care of by us. To be able to support charities with children who are in need, abused, without shelter, needing food — to me that’s a calling, to me that’s a responsibility to help,” says Suzanne, who is currently in the process of organizing her model-daughter’s move to the U.K. for university in September. Like a revolving door to Bergdorf’s, life has a way of coming full circle. Today, she and her sidekick interior designer Glenn Dixon are often spotted together at the city’s top fundraisers and front row at the world’s Big 4 fashion weeks, where once, at the Ritz in Paris, Karl Lagerfeld wondered aloud to Dixon just “who is that fabulous woman you are with?” On the surface, Suzanne is the emblem of glamorous, receiving Christmas cards from Victoria Beckham, accepting invites from Domenico Dolce and Stefano Gabbana when they debuted their Alta Moda collection on the island of Capri last year. “Being Suzanne’s friend, you get to do some pretty crazy, fun stuff, and her love of fashion has brought us all over the world,” says Dixon. “But it’s a big, real passion of hers to support kids. She’s definitely taught me a thing or two about giving back. She does it better than anyone I know.” Beneath the folds of her silk faille dresses is a whip-smart, confident and spontaneously funny woman; a mother and wife adamant about Sunday family dinners; a successful benefactress acutely aware of and thankful for her surroundings. “I never grew up like this,” says Suzanne, who was born to Hungarian parents in a small mining town in northern Ontario. “My mother was proud that she could even afford to buy me a new pair of shoes — Buster Brown shoes, my first fashion label,” she reminisces. As I politely wander around the Rogers household, it’s clear that Suzanne’s sartorial taste extends well beyond her curated closet, spilling throughout her home in cascading florals, whispers of pink and pops of eclectic art. “I love looking for black and white fashion photography, I have a big interest in that, and I’ve collected quite a few pieces throughout the years,” says the proud owner of Lillian Bassman’s Blowing Kiss, one of only four produced in the world, and two Melvin Sokolsky portraits with model Simone D’Aillencourt floating in bubbles over Paris. The recently appointed honorary chair of the 2015 Governor General’s Performing Arts Awards Gala National Committee nods her head toward Nobody Else But You, an André Monet portrait of a pensive Marilyn Monroe, which hangs impressively on a stark wall above a modern divan near the main foyer. The Montreal-born artist’s striking collage and mosaic technique also caught the eye of the Opera Gallery in London, which commissioned him to create a portrait of Prince William and Kate Middleton for their royal wedding in 2011. It wouldn’t be the first time Suzanne shared an eye for the talent of a rising Canadian artist. She funds the annual $25,000 prize for Most Promising New Label as part of the Toronto Fashion Incubator competition, and is also on the judging panel for the annual Canadian Arts & Fashion Awards. I used to play the violin. When I was growing up in London, Ontario, the elementary school I went to for a few years was a performing arts school. So I played the violin for many years. I was at the Dolce & Gabbana couture show in Capri last year as a guest of theirs. The after-party started at midnight, in a little tavern, and they’re dancing on the stage, singing amazing Italian songs, and having the best time! I loved seeing them in a comfortable social setting and enjoying everything — just imagine the stress they go through, day in, day out, collection after collection. They like to unwind just like everybody else does, right?